m tall, sometimes up to 25 m tall. Stems are spiny, 3-4 (-5) angled up to 5 cm in diameter. Spines in clusters with one spine longer than the rest. Flowers large, tubular and spineless, white to pale yellow. Fruits bright red strongly covered with wart-like knobs. Harrisia balansae is native to Argentina, Bolivia, Brazil and is naturalised in South Africa where it has escaped from abandoned farm houses. Harrisia balansae spreads mainly by seeds and vegetative means. Harrisia balansae has been recorded only in two provinces of South Africa, North West and Limpopo. In North West it has been recorded in Groot Marico where it is suspected to have escaped from an abandoned farm house. In Limpopo it has been confirmed in Modemolle at Mkleuw and 26 Succenvale Farm and Carlifonia Farm in Letsitele just outside Tzaneen. Harrisia balansae inhabits forests and savannah biomes mostly dominated by species of the genus Acacia and in disturbed areas. 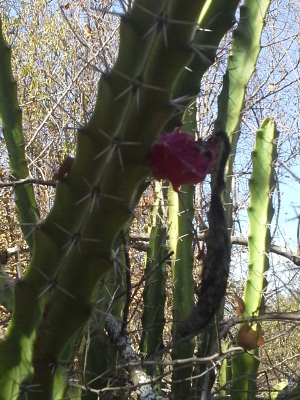 There are no registered herbicides for this species in South Africa. 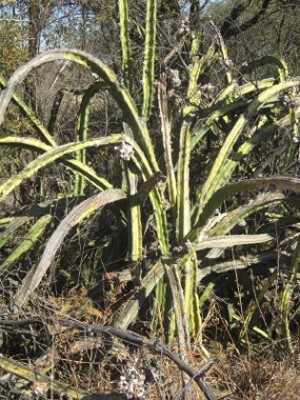 Report sightings of these plants to the Invasive Species Programme (ISP) at SANBI. We will need to know its locality (the exact locality, supply any landmarks or GPS information if possible).